Shaded relief bathymetry of the Overlapping Spreading Center (OSC) at 22°S along the Valu Fa Ridge (VFR). 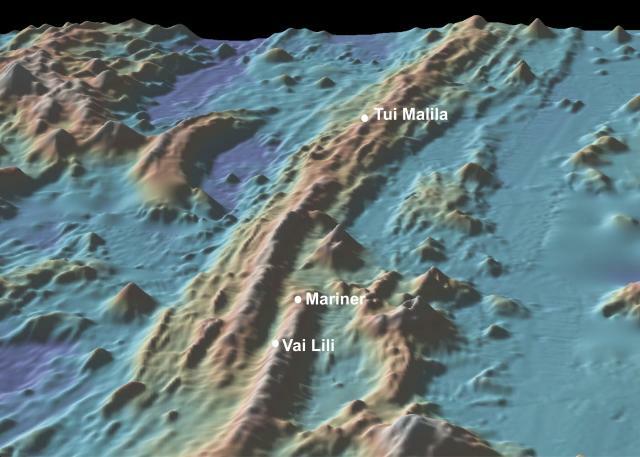 The locations of the Tui Malila (-1870 m depth), Mariner (-1910 m) and Vai Lili (-1720 m) vent fields are indicated with white dots. View is to the north, and vertical exaggeration is 2x. Image made using GeoMapApp.